Anniversary is a milestone event worthy of the best celebration and recognition. However, you may have no idea on how to make it special. Do not worry. Anniversary photo cards are delightful reminders of how much you care and appreciate your partner in life. 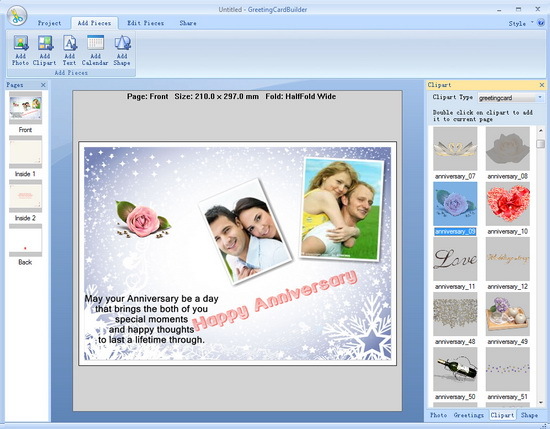 Greeting Card Builder is a great useful greeting card maker that helps you make personalized anniversary photo cards to convey messages of love and appreciation. Here are some simple steps on customizing your own photo cards. 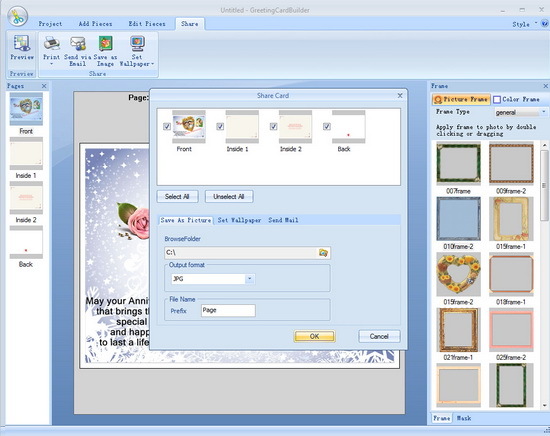 Open Greeting Card Builder and click Create From Template pane. 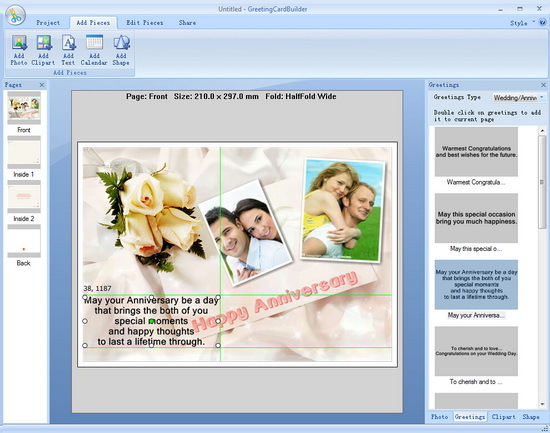 Choose one favorite anniversary template and you are free to change its size by clicking Change Template Size. Click Add Pieces → Add Photo pane on top of window to add your fond photos to the edit area. 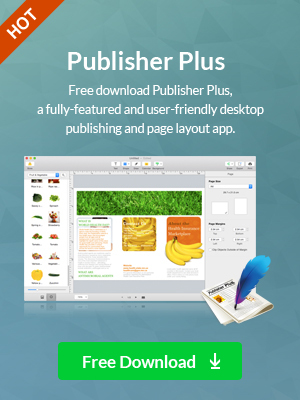 Here you can resize, rotate and crop photos as you want. 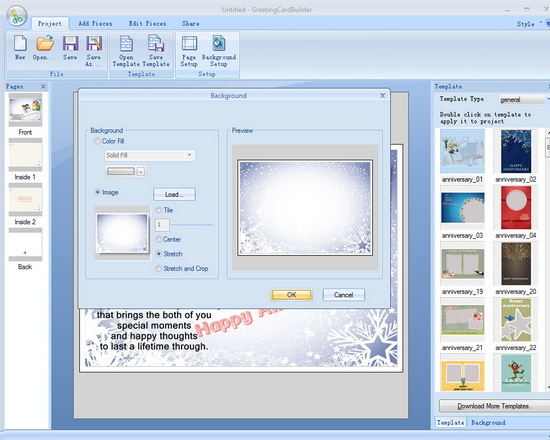 You can add some embellishments, such as background, greetings, clipart, frames, etc. to make your photo cards more beautiful. Click Project → Background Setup pane on top of window and set your background by clicking Color Fill or Image according to your own needs. Open Add Pieces pane on top of window and then click Greetings pane on the right corner. Next choose anniversary greetings type and select one you like best to add it by double clicking or simply dragging. 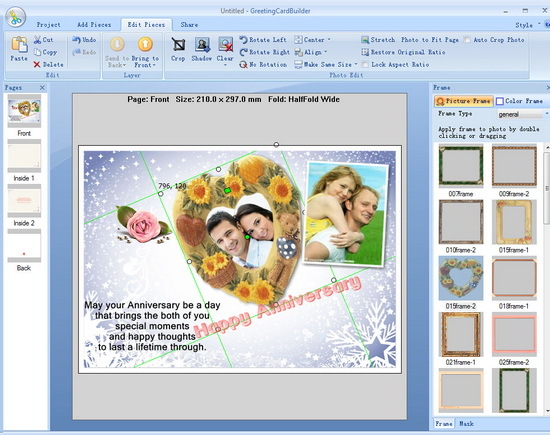 Click Add Pieces → Add Clipart and choose one loved anniversary clipart type to add it to current page. 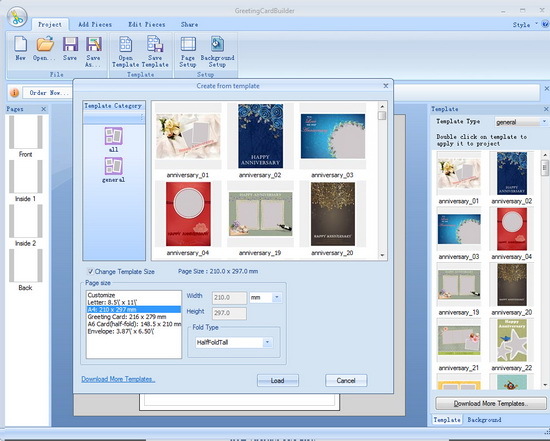 Click Edit Pieces pane on top of window and then you will see Picture Frame and Color Frame on the right window. Select one photo to apply picture frame or color frame based on your own needs. Click Share → Save as Image pane on top of window to save your current photo card as an image or click Print pane to print it out as you want. These are really simple steps on making meaningful anniversary photo cards that are the perfect choice to celebrate your anniversaries.